THE BOOK "ORTHODOX" DOCTORS COULDN'T KILL HITS THE COMPUTER AGE! Gain the upperhand on your health the easy way with Dr. Wallach's Let's Play Doctor-Computer Database. Over 300 health disorders, 800 subjects! Everything from "Let's Play Doctor" book and much more! Fast and easy to use. A simple to understand computer database... Has over 10,000 cross references... Vitamins... Herbs... Aroma Therapy... Essential Oils... Minerals... Complete information with the touch of a finger! 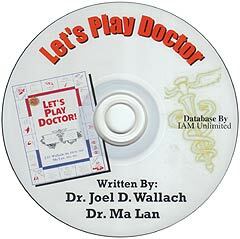 Written by Dr. Joel D. Wallach and Dr. Ma Lan. Database by IAM Unlimited. (PLEASE READ!!!) Windows 95/98 2000/ME/XP, 16 MB RAM, @X CD-ROM Drive, SVGA (800x600, 256 colors) monitor, 40MB Hard Disk Space "NOT COMPATIBLE FOR WINDOWS Vista, 7 AND 8"